EIGHT OUT OF TEN ROUNDS TO COUNT For Prizes – everyone completing 8 events will be entitled to prize money. All prize money needs to be collected by the 31st January 2019 or it goes back into YCCA funds to support our youth trips to race in Belgium. If you wish to donate your winnings, you don’t need to do anything. UNDER 8/10/12 races are Stand alone. In Under 12s NO exchange of equipment is now allowed in any cross race. This means no exchange of bike, wheels etc. If you are changing age category, please hand in your OLD number at the first Winter Event you attend and it will be exchanged free of charge for your new category number. Otherwise, you will have to pay a £2 re-registration Fee. 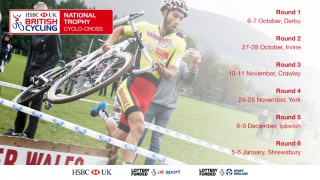 JUST TURN UP ON THE DAY AND PAY A REGISTRATION FEE (£2) AND COLLECT YOUR NUMBER FROM THE NEW RIDER TABLE before going to sign on. You keep this number until you change age categories. Numbers are to be returned at the last event they attend in Summer. Again, there will be a £2 registration fee. This is paid with their entry fee at the Under 8/10/12 signing on desk at their first event and not at the new rider table. NO CHIP WORN ON ANKLE-NO RESULT! Get there in plenty of time to sign on. Signing on for the U8,U10,U12 will open an hour before each race and for all other categories, an hour an a quarter so you have plenty of time. As before Podium Prizes will be awarded on the day and series prizes at the end of the season with 2 less than the final number of Yorkshire Points Rounds run to count. Podium will be AS follows subject to riders being identified. 1st 3 U8,U10,U12 Boys and Girls. No series prizes just on the day. There are no money prizes this year but special awards for the top 3 in each race. Women’s Race- 1st 3 Women over the line plus 1st Jun Women, Sen Woman or Vet Woman if not in top 3 over the line. **If you are a V45-49 you can race in the S/J/V40-44 Race if you require BC Points. The purpose of splitting the V40 cat is to even numbers in the two races.